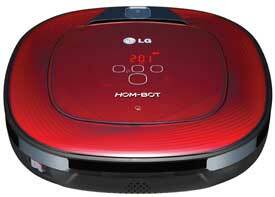 The new LG HOM-BOT Square is the new dimension of automated home vacuuming. First, there's the ingenious square design just what you need to really clean corners and wall edges. Next, there's HOM-BOT's amazing performance as advanced as the Dual Eye Mapping System, as sparkling as its 7 Smart Clean Modes. HOM-BOT is the future of carefree convenience. Even better, it's ready to impress you today. It's good to be square! 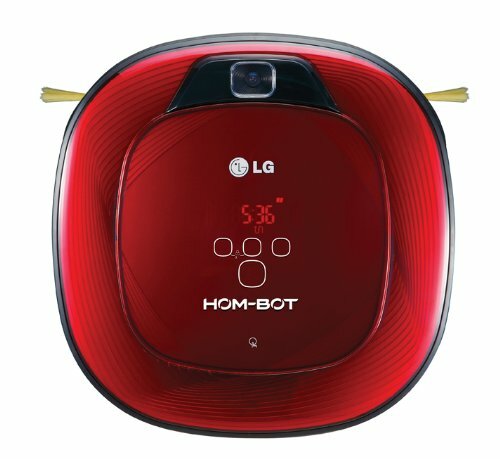 LG's HOM-BOT Square with its longer side brushes reaches corners, wall edges and small areas more effectively than traditional round-shaped robot vacuum cleaners. Look forward to the thorough, fresh-everywhere cleaning that will delight the fussiest homeowner. 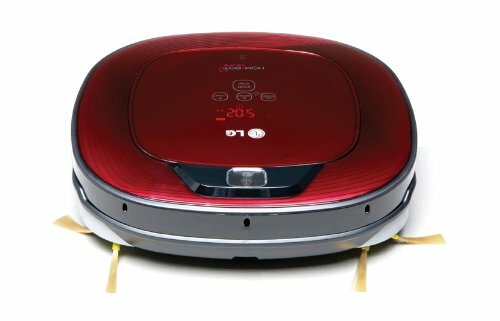 You use two eyes when you're cleaning, and so does HOM-BOT. With cameras mounted on the top and bottom, HOM-BOT maps the area around your home as it cleans, calculating optimal cleaning paths 50 times each second to make sure it doesn't miss a spot. The top camera takes as many as 30 images every second while the optical sensor on the bottom reads the surface up to 2,000 times per second for mapping and location purposes. The only thing you'll see is better, more efficient cleaning. 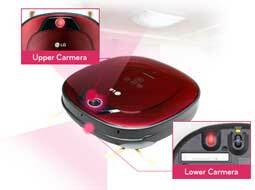 LG knows that every room and cleaning chore is different. That's why HOM-BOT Square offers 7 Smart Cleaning Modes…everything from Zig-Zag for large areas with few obstacles to Smart Turbo, which automatically adjusts to floor and carpet surfaces, and cleans with turbo-charged performance. While Hom-Bot's cleaning technology makes people take notice, it still manages to clean quietly, thanks to smart design features like insulation that's meant to absorb vibrations and reduce noise. It creates low noise so you can carry on your daily activities without interference – just an incredible 50dB. When it comes to efficient cleaning, HOM-BOT Square never gets sidetracked. If cleaning is interrupted and the vacuum is moved to a new area, a clever function called Auto-Resume comes into action. Auto-Resume enables the vacuum to return to exactly where it had left off, so that cleaning is resumed precisely from its original location. Learning Function allows HOM-BOT to recognize the areas it has cleaned on previous occasions, so the vacuum precisely remembers the optimal cleaning path and positioning of obstacles. 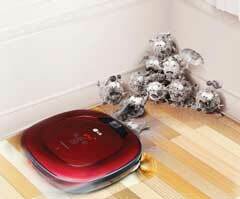 HOM-BOT cleans as if it has photographic memory, ensuring faster and more efficient cleaning every time. 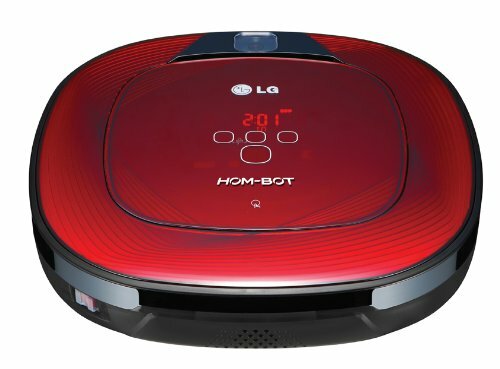 The LG HOM-BOT handles a wide variety of cleaning tasks, because modern homes require cleaning versatility. A powerful main brush loosens and sweeps dirt and dust throughout the home, while side brushes clean corners and edges. And at just 3 inches tall, it's slim enough to fit under most furniture with ease. Smarter both inside and out, HOM-BOT Square is quite the conversationalist. Voice Alert feature "tells" you when cleaning is complete, the battery is being recharged, Dust Bin needs emptying, and many more. LG HOM-BOT Square has 120 words in its memory.